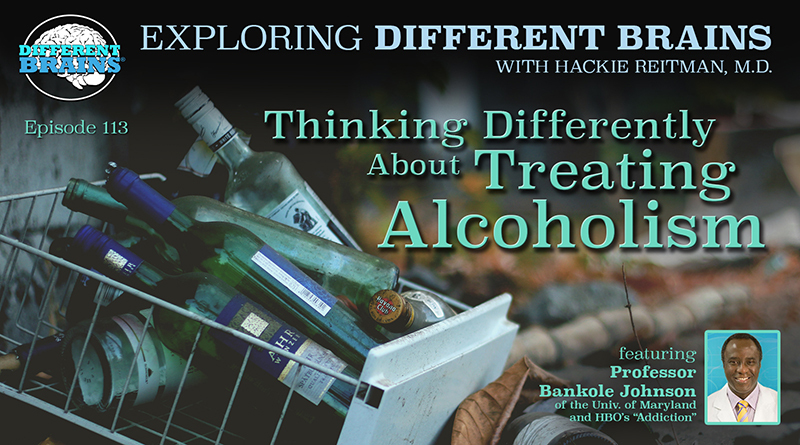 (22 mins) In this episode, Hackie Reitman, MD. speaks with David A. Grant, the founder and publisher of TBI HOPE Magazine. David is a brain injury survivor that has dedicated his life to being an advocate for those affected similarly. 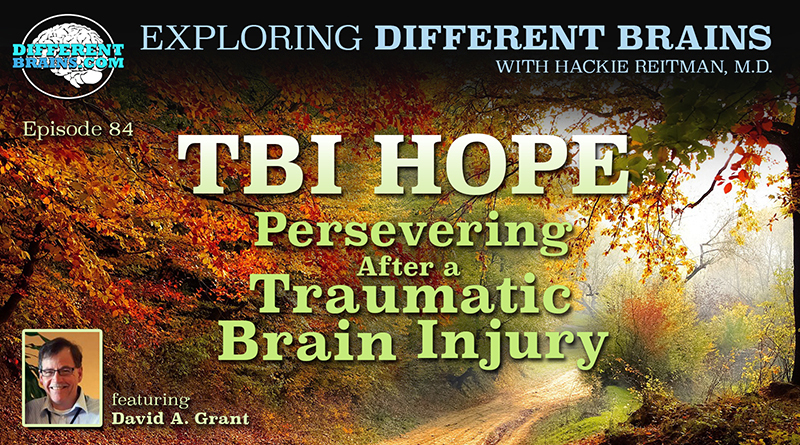 David discusses how his TBI occurred, the importance of positivity, the connections between brain injuries and PTSD, and the inspiration behind founding TBI HOPE Magazine. HACKIE REITMAN, M.D. (HR): Hi, I’m Dr. Hackie Reitman and welcome to another episode of Exploring Different Brains. Today, we go all the way up to New Hampshire, where David A. grant, one of the international leaders in traumatic brain injury, and advocate, a speaker, an author. And he himself has had quite a lot of experience with it. He has founded the TBI Hope Magazine, and does a whole bunch of other stuff we’re gonna hear about here on Exploring Different Brains. David, welcome! DAVID A. GRANT (DG): Thank you, Hackie, and thank you for your kind words! HR: Well thank you for everything you’re doing. You know, here you are, at the time you think you were 49 years old and you smash your brain up. Tell us how that happened. DG: (laughs) I’ve never had anybody put it so succinctly. Yeah, I wanna keep it kind of light today but I’m an endurance cyclist. DG: Yeah, and I’ve met a lot of my children and my step-children’s’ friends over the years. But I never expected to meet one of my step-daughter’s Facebook friends the way we met. I was out one day in November of 2010. I push out 20 to 30 miles every day. I’m still up to the task. And a young man t-boned me at an intersection on Main Street in our town. And from that point to this point, it’s been quite a journey. HR: Well let’s start at the beginning. You’re driving along on your bike, you’re an avid bicyclist, you’re pushing along, and BOOM! Your whole life changes. Takes us through it. DG: Yeah. I pulled up to an intersection that I’m intimately familiar with. I’m probably–it’s 3:42 in the afternoon. And I tend to be a relatively conservative guy. Had the reflective cycling clothes on. Looked to the left, clear, looked to the right, clear. Gave one push of my pedal, and the next thing I know I was airborne. My first thought was, “Oh my goodness, I’ve just been hit.” And it’s interesting because when you go through an extreme trauma like that, time tends to shift things a little bit. And it was only when I was in the air that I heard the sound of my body impacting the car. I went right through the windshield of the car that hit me. And physics are what they are. He catapulted me. My first impact was against the windshield. My brain inside my skull, bounced from one side, then back to the other. And then I flew about fifty feet down Main Street. And that superman act ended with me hitting the black top and being knocked senseless. Not my best day, but if I fast forward to today, a lot of good has come out of it. HR: Wow. So now they take you to the hospital I assume? HR: And they do what? A CAT Scan, MRI, what do they do there? DG: Yeah, what they did, I’m fortunate in the community that I live in, Hackie, is in southern New Hampshire. And the nearest trauma center is across state lines down in Massachusetts. And I also had the good fortune of being struck about a block from our local fire station. So there were first responders on scene very quickly. My wife and I were relative newly weds, and I did have the where-with-all as I was being strapped into the gurney to repeatedly call out my wife Sarah’s cell-phone number. There were able to get her on the phone. And she got the call that no wife wants to get–“Your husband’s been critically injured.” And by circumstance, she ended up following the ambulance down to Massachusetts, and they assessed me. They said I had a broken elbow. Because of the force of the impact, I was cut up pretty bad. Sarah spent the next three or four days pulling shards of glass out of my scalp with tweezers. I tore up a whole bunch of ligaments. I was covered with bruises for weeks. and they had wanted to keep me overnight for observation. They did a CAT Scan that night as well to see if there was perhaps a bleed. My helmet was ruined. And against medical advice, I informed the attending staff that I am neither sick nor infirmed and I am going home tonight. So I went out with marching orders to see a neurologist and an orthopedist the next day. And the orthopedist put my arm in a cast and he said, “You know, you’re going to be uncomfortable for a couple of months and you’re going to have pain for six months. And Hackie, almost six months to the day, the pain in my arm disappeared. And we went to a neurologist for an assessment. And I was subject to what’s called a Montreal Cognitive Test. It’s a series of questions to determine my cognitive ability. And I was given a clean bill of health. Literally a high five and told by the doctor that I had dodged a bullet. And a really big congratulations. And time has proven that not to be true. HR: Wow, so now you’ve done what gets all of us orthopedic surgeons nervous. You ride a bicycle or a motorcycle, that gets us real nervous. And you smash your head. But you get a clean bill of health and things are looking good. What was the first tip off that things were not looking so good. DG: You know, that’s a really good question. I had–and it’s very abstract and hard to find but I had a feeling on the inside that things just weren’t quite right. My body was beaten up pretty badly so it continued the slow process of recovering from my physical injuries. And I said to my wife repeatedly, “Something’s just not right.” The first indicator actually came in January. So we’re a full two months out after the accident. By that time I was in the grips of just devastating PTSD, horrific nightmares, two, three, four nights a week. The wake-up at twelve-midnight or five a.m. screaming, covered in sweat kind of nightmares, and it didn’t take a rocket scientist to quickly play connect the dots with that. But in January the following year, I went to read something and my brain wasn’t able to recognize letter. And the analogy, I like easy, simple to understand analogies. They just work the best. Imagine if you just opened your office door and you stepped out and you were in Tokyo instead of Fort Lauderdale. And all of the signs out there had characters that you knew represented text, but you’re unfamiliar so you weren’t able to translate the text to anything meaningful. That’s what it looked like. I looked at the text and I can no longer read. DG: And it happened just like that. DG: One day, I could read. And one day I couldn’t. And again, this is in January. I had a medical professional postulate that it could’ve been clearly there was damage. And he had suggested it may have been the microscopic level and it takes a couple months for damage like that to turn into car tissue. So I immediately freaked out. We went down to the neurologist the next day. And he said, “You know, it looks like you’ve probably had a concussion.” And my first thought was, “yeah, that’s a pretty good assessment based on what’s happening. Early on I was all about “when am I going to recover? When will I get back to where I was?” And he said, “6 months, 12 months, maybe 18 months max, but you’ll be normal and completely healed within that timeframe.” And time has proven that not to be true as well. HR: Yeah but you withheld information that you were never normal to begin with, right? DG: Well normal is a setting on a washing machine. DG: That’s about as close to any of us are to normal. HR: Well said, well said. DG: It’s not stealing it from someone else. HR: Now, tell us how you got into advocating and helping empower others and getting into spread the word about Traumatic Brain Injury, TBI. DG: There was a second incident that happened in March. And that brought me back to the neurologist again. And I went out for a bike ride and it was going to be a 30-mile ride. And my mental perception being five minutes into the ride, I looked at the GPS device that I was using to measure my ride. And it showed that I had already ridden thirty miles with virtually no recall. DG: And it’s akin to having a digital camera with no memory card in it. I looked normal, but something clearly wasn’t right. So that was the third and final trip to that neurologist. So we were at the neurologist the following day. And this time, the doctor that we had been seeing took to the head of the practice and he was the first one to officially label me as living with post-traumatic stress disorder. And he said, “Yep, we’re going to move from a slight concussion to a severe concussion. But not to worry, David. You’ll be okay. It might take five years, but you’ll be okay after five years.” And again, it is what it is. I’ve cut everyone that has crossed my path a mulligan. Everybody did the best they could with the information they had at hand. And I’ve seen a lot of folks over the years become embittered by errant, well-intentioned, medical diagnoses. And you can’t live in that space of carrying resentment or bitterness because, Hackie, it’s a barrier to moving forward. And if you live in that space, you’re disserving yourself and you’re cutting back and your ability to serve humanity. HR: Yourself, in your mind, you clearly see the physical relationship between the physical trauma and the PTSD. And what we’re learning, and all the people we’re meeting at differentbrains.com, between all the neurological and the intellectual, and the mental health issues, it’s all the same stuff and it all has an anatomical basis. It’s not just a separate thing. Here your brain get all jumbled around and it’s manifesting itself in behaviors, interpretations, PTSD, nightmares, inability to read. And when technology gets there, which it rapidly is, if we were watching you perform those talks, we would see your brains light up in certain areas asymmetrically and so forth. HR: But you’ve put that all together. DG: Now interestingly, I’ve crossed paths over the last six and a half years with literally thousands of folks that are in the brain injury survivor family. And the piece that I find interesting is those that have recall of whatever the initial trauma is, are more inclined to deal with the dual-diagnosis with PTSD, and brain injury. And those that have no recall of whatever the traumatic event is–I don’t think I’ve ever met a single brain injury survivor that fell into the “I have no recall” that also co-exists with PTSD. So in one respect Hackie, it’s kind of bitter sweet if I recall of the event, and I still live daily with PTSD today, my fate might have been a little different. But part of what my wife and I have done in terms of saying “okay, how do we co-exist with this?” Because there are still some really bad days. I look at it as when I experience the tougher times, even still, or because brain injury is a family condition it doesn’t affect just the individual, when as a family we experience challenging times, what do I do? Do I look at that and say “okay, poor us, poor us, poor us!” Or do I say rather that by living with these experiences, I am now better able to understand those who live similar experiences, not because I’ve read about it in a book, but I’ve been there. So I try to be mindful of the fact that maybe a tough time is ultimately an asset as it helps others. HR: And just in case this is of any help to you because it was of help to me. I read the first half of a book by Viktor Frankl, called “Man’s Search for Meaning” I think. And he was the founder of Logo Therapy. I only read the first half, the second half got into logo therapy. The first half started with how he got into all that, which was his experience in the concentration camp. Where he would have to be moving the dead bodies of friends in the barracks, the stench was terrible, he was barely surviving. And it was the most horrible time one can imagine. And he would look out through the dirty windows with the barbed wire, and look off in the distance, and maybe see a sunset. So he would say “Right there, I had a choice. My choice was to just curse God and say, ‘This is awful, this is terrible, this and that.’ Or to say I hope you have a good reason for this, this is awful, don’t let it happen again. But that’s a beautiful sunset” So the choices we make and the mindfulness you’re talking about, when it is our choice. It’s not always our choice naturally. And you’ve bee there. DG: Yeah. You know a lot of it’s a matter of perspective. For years, my wife Sarah said the curse would become a blessing. And I wrote a short piece about this just this week. One of my sayings for the first couple of years is I would rather give my right arm, and not have a brain injury. See the David who sits before you, I’m not who I used to be. I’m a very typical TBI guy. The other piece that happened in 2011 is I lost the ability to speak. And that happened somewhere–February, March, April, of 2011. I developed a stutter. Aphasia. The fact that I’m able to hold a conversation at this time of day is just a testament to neuroplasticity and how healing can take literally years. But I used to say I’d rather lose my right arm and not have a brain injury. These days I’d rather keep both arms. I’ve come to the point where this isn’t how I envisioned our lives to be, but over the last few years we have had enumerable blessings. And the piece that my wife and I love, and I reference her a lot because we’re very much a team in all of this is there’s an amazing subculture of people that serve the brain injury community. Thank you for the book reference, I will look that up, and I’m going to fire one back at you. I don’t know if you’ve heard of the concept “post-traumatic growth.” If you haven’t, Google it. There are some fascinating scholarly articles in the gist of post-traumatic growth. My editor–I’m a staff writer for brainline.org as well–brought that concept to me a year, maybe a year and a half ago. And in its simplest forms, people who have experiences extreme trauma do not become burdened by that trauma, nor do they let it ruin their lives. They use it as a portal, an entry way, to help serve others that have experienced similar experiences. I started looking around, Hackie, at the landscape of my life. And I went, “you know what? A lot of people that are apart of that new circle of those that we associate with have all experienced post-traumatic growth.” It’s a fascinating concept. HR: I love it. I love it. Post-traumatic growth. DG: Yep. And what it does is it ads purpose to it all. Just like the author that you referenced, who said, “You know what, God, thanks for letting me look at this”–You know if it was me in his shoes–“Thank you for the gift of a couple of minutes of a sunset and thanks for reminding me that I’m not here alone.” You know? HR: Tell us about the TBI Hope Magazine. DG: We average about a quarter-million user engagements a month. It’s one of the world’s largest social communities. HR: David, can you tell our audience, who want to know more about you and your work and what you do, how they can learn more about you and get ahold of you? DG: Sure thing, Hackie. The easiest way would be to head directly to TBIHopeandInspiration.com. From there, we’ve got readily accessible links to all of our social communities including Facebook. And I like to keep it simple, so that be the easiest way to do it. HR: Well David, you’ve been very inspirational. It’s been a pleasure to meet you here at Exploring Different Brains. Thank you so much for being with us, and David A. Grant, keep up the great work you do in the traumatic brain injury community. DG: Thank you, Hackie, it’s been a pleasure to be here. In this episode, Harold Reitman, M.D. speaks with Sarah Howard. 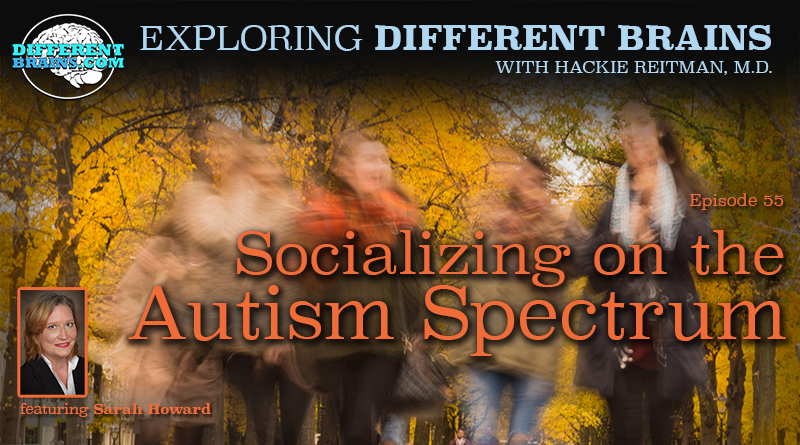 Sarah is a member of AASCEND, a meet-up group organizer, and an adult on the autism spectrum. In this episode, Harold Reitman, M.D. 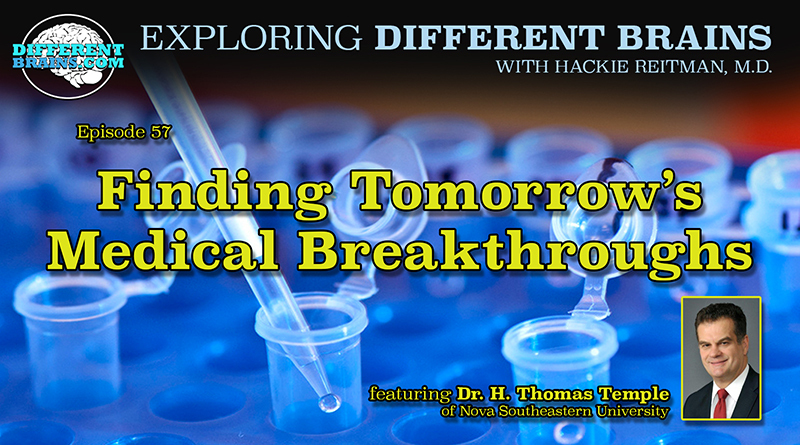 speaks with Dr. H. Thomas Temple, Senior Vice President of Translational Research and Economic Development at Nova Southeastern University.